Master the Art and Science of Patient-Centered Care. Experts predict a shortage of no less than 100,000 family medicine doctors by 2025. That means millions of Americans will turn to family nurse practitioners for high-quality, affordable care. Gain the credentials to serve them now with an online MSN-FNP degree from Bradley University. Why earn an online MSN-FNP degree? Demand for primary care services in the U.S. continues to rise — while supply of the family physicians able to provide them continues to shrink. What does this mean for a talented RN like you? It means there’s never been a better time to specialize your expertise as a family nurse practitioner. Acquire a big-picture, interprofessional view of the modern health care marketplace. Expand your expertise in advanced nursing theory, patient-centered care and evidence-based practice. Provide high-quality care to individuals and families throughout the life continuum. Gain the autonomy to conduct exams, diagnose illness and treat clients across the life span. Acquire the high-level leadership skills to thrive in nearly any health care setting. Many states now allow nurse practitioners to work without a supervising physician. Complete your path to greater autonomy now; enroll in our online MSN-FNP program today. Is an online family nurse practitioner degree right for you? Need help deciding if an online MSN-FNP degree aligns with your current needs and future goals? We can help. You’re passionate about family medicine. You want to establish yourself as a leader in primary care. You’re a nurse ready to broaden your scope of practice. You wish to advance your professional career and eventually earn your DNP. You’re ready to earn an advanced credential that can position you for financial growth. You want to collaborate with and learn from other aspiring nurse practitioners. You want a flexible online learning environment that fits your busy schedule. You’re eager to learn from a faculty of passionate and experienced clinicians. Learn from Innovative Nursing Leaders. 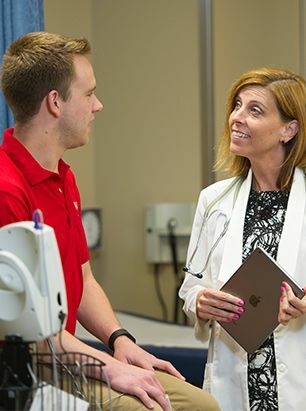 The dedicated faculty members who lead our online MSN-FNP program are committed to helping you succeed as you take the next step in your nursing career. They each bring a broad base of clinical expertise and professional experience into our online classrooms each day, and they are eager to share their knowledge with you. *The Master’s Degree Program in nursing, Post-Graduate APRN Certificate Program, and the Doctor of Nursing Practice Program are accredited by the Commission on Collegiate Nursing Education, 655 K Street NW, Washington DC 20001; (202)887-6791; http://www.ccneaccreditation.org.